Wow – how gorgeous is this build? Somebody clearly spent a lot of time going through a lot of little details. The end result is a stunning bike fit for a nice parking spot in the den. And while it clearly looks the part for the racetrack – and I’m sure has performance to match – I would personally be afraid of every little bug splatter, every potential rock chip, every speck of brake dust, and the awful possibility of dropping this thing on the tarmac. This bike is a beauty that looks way fast just standing still! 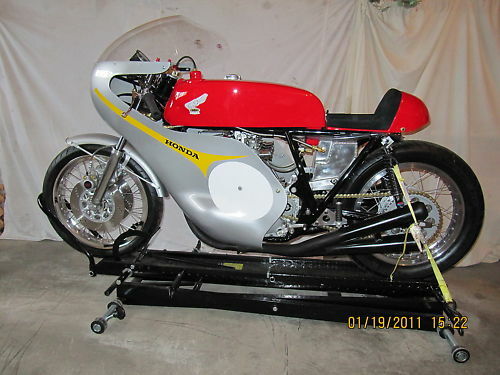 Honda CR 750 .Built in 2010. Engine has many modifications, Racing Camshaft, ported and gas flowed head, total loss Boyer ignition. lightened crank. Generator and starter removed. 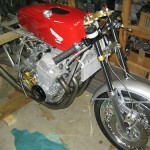 Front forks overhauled, double disc brakes, rear brake is cable operated, Alloy rims front and rear, Shortened frame. Swarbrick megaphone exhaust. engine is narrowed, Avon tires. Central location of battery, Alloy oil tank. Race fairing in Honda factory colors. Ready to Race. 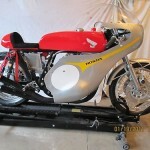 The world of vintage racebikes is very hot right now. 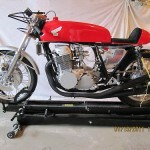 The whole Cafe bike craze (which you can see here at our sister site) started as a result of kids wanting to make their streetbikes more like the racebikes they saw on the track. The CR750 is one of the iconic, classic racers: Long front fairing, short rear overhang, spoked wheels and a wide, four cylinder engine. This particular build has a lot of trick parts and fabrication. 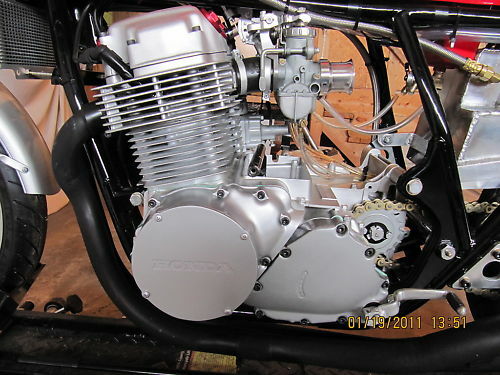 Note the narrowed engine covers, allowing for greater cornering clearance. 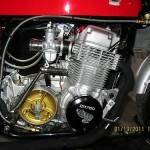 Check out the four open carbs with velocity stacks. Drool over the clip-ons, the headers and the bodywork. Yeah, you know you want one just like this. The best part is: this one is available! I know you think that you will need to visit your friendly neighborhood lender, mortgage the house, raid the kids’ college fund, and empty your 401k for this baby – but not so. The opening ask is $6k, with the BIN set at $8,000. 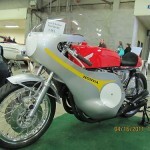 That is less cash than a restored sand cast CB750, and this one is spotless. For more info and pictures, click on the link and jump over the the auction. 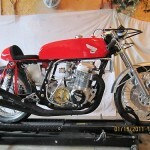 This bike is really worth a look!